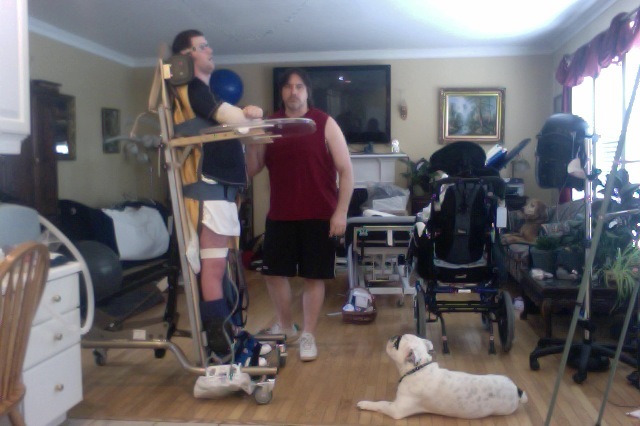 Ryan in Standing Frame at 90 Degrees – We Got This! Ryan’s a relatively tall guy. He’s just over 6′ 1″ in height. Not towering, but taller than most men. Anyhow, I was looking at him as he was harnessed into the standing frame and thought that many of you probably have never seen him standing (nearly) upright. He’s on a platform that elevates him a good six inches, so he seems taller while using this therapy. For reference, I am just a tad bit taller than Ryan… at least the last time we stood back-to-back a few years ago. I’m 6’2″ on the dot. So, you can use me as a reference in the picture. Also, how does Duke keep working his way into photos? Oh, wait… he follows Ryan everywhere… that’s how. Ryan completely upright in the standing frame. This picture gives you a good shot of our (one-time) family room. I’m not sure another piece of therapy equipment could be packed into it. I’m really not. It’s nice to know this will be short lived, as everything should be moved downstairs by this time next week. Awesome 🙂 And it’s nice to see you out of scrubs, Ken! This is great to see. Brings tears to my eye’s but a joy to see. I am just an old sentimental guy, lol. My prayers continue for Ryan. Careful… Duke does a lot of things I do. Rather not get into that.